The best way yet invented to tour a vineyard! Puddleduck is a welcoming family-owned estate set around a beautiful duck pond near Richmond. Your experienced Segway guide will have you comfortable and confident on a machine in minutes and then you'll be ready for the tour. 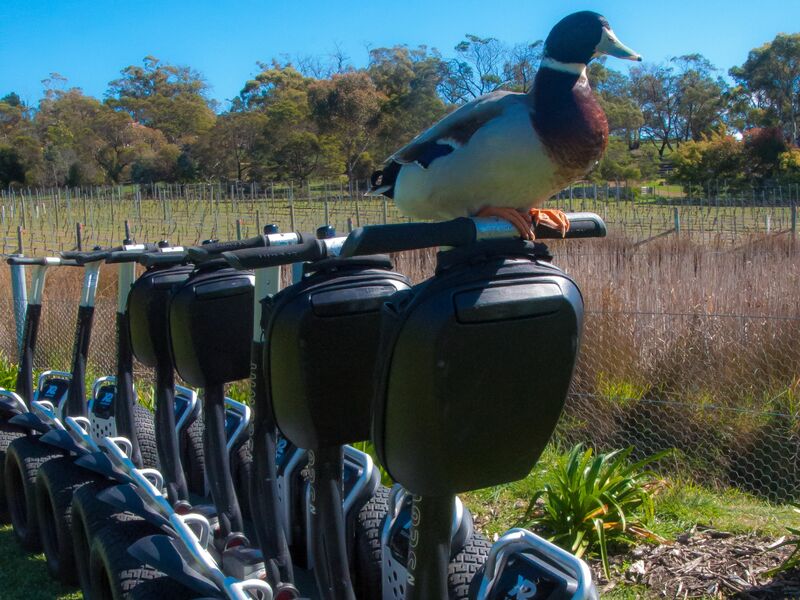 From your Segway X2, you’ll enjoy a tour of the vineyard and the estate, effortlessly gliding alongside the duck pond, rows and rows of vines and around the property. After your tour you will be welcomed at the Cellar Door by your hosts where the person pouring your tasting also helped to pick the grapes and label the bottle you are drinking from. Relax and enjoy your cheese platter in the gorgeous garden and say hello to the vineyard ducks and resident wine dogs! Minimum 4 participants, maximum 8 Minimum age for participants is 12. Minimum weight for participants is 45kg, maximum weight is 117kg. For answers to other frequently asked questions visit our FAQ page.